There’s nothing like a winner or two to give the confidence levels a boost and apprentice Jean Van Overmeire is hoping for a change of fortune at Rosehill on Saturday. Jockey Jean Van Overmeire (Pic: Steve Hart). 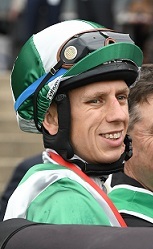 While he was NSW’s leading apprentice last season and runner-up in the metro apprentice premiership you could be forgiven for thinking Van Overmeire has gone missing – and it’s something he’s frustrated about. Racing is all about winning, especially when you’re trying to make your mark, and the 24-year-old is keen to get back in that groove. “I set a very high bar for myself, a lot of people tell me to not be so hard on myself but it’s in my personality to set high goals and want to achieve them,’’ he said. With just the one city winner, Nordicus at Randwick on November 6, and a lot less statewide than at the same time a year ago for the season it’s easy to understand why he feels out of sorts. Around the middle of November in 2017 his city winners totalled just three for the season but in the summer months Van Overmeire piled on some 20 metro wins. And he believes he has the chance at Rosehill to gain some momentum with Bjorn Baker stablemates Irithea and Redouble giving him the right signs ahead of their first-up runs. Consistent mare Irithea steps out for the first time since her placing in the Group 3 Tibbie Stakes back in September in the Summer Hospitality@ATC Sprint (1200m). “I’ve been riding her work the last couple of weeks and she’s in very good form, she’s very fresh and bouncing out of her skin,’’ Van Overmeire said. With his 2kg claim, Irithea carries 58kg which is just 3kg above the lowest weighted horse in the race and while she’s a $10 chance with TAB the jockey feels they’ll be hard to catch. It’s fair to say Redouble has been hard to catch at times but the five-year-old did more than enough in his barrier trial placing to Deprive on Monday to say to Van Overmeire there’s a win in him this preparation. Whether that comes in the Tab.com.au Handicap (1200m), where Redouble is a $10 chance, remains to be seen but the gelding produced a couple of slashing runs at 1100m early last preparation. “He felt good within himself and I think he will go well fresh,’’ he said. He says Redouble is a horse that needs things to go his way and the make up of Saturday’s race, where he’s likely to have to drift back, suggests that will be the case if he is to win. “I wonder whether he is a natural on speed horse, his best races have been when he’s sat midfield or further back,’’ he said. Van Overmeire’s other ride at Rosehill is on Mudgee galloper Bezel in the Country Classic (2000m) where he’s an $8.50 chance in a wide market.